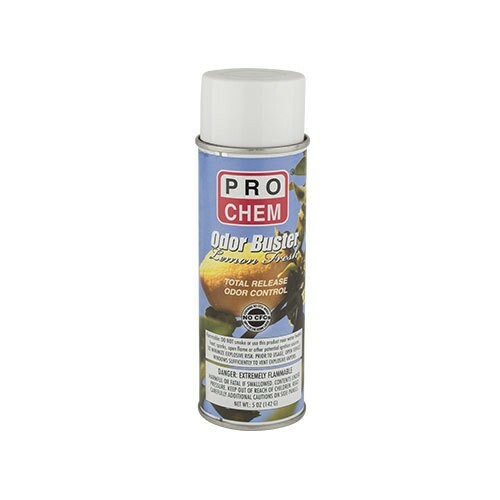 Odor Buster | Pro Chem, Inc. ODOR BUSTER is a total release room deodorizer with a fresh, lemon scent. It stops unwanted odors and deodorizes the air in bathrooms and any other areas where malodor exists. This total release spray delivers an ultra-fine mist to effectively freshen rooms up to 7,500 cubic feet. It is formulated to neutralize tough odors, such as sulfides (from eggs, garlic, and onion), amines (from fish) and pyridine (from tobacco smoke). See product label for complete use directions and precautionary statements. Turn off ALL ignition sources such as pilot lights (shut off gas valves), other open flames or running electrical appliances that cycle off and on (i.e. refrigerators, thermostats, etc.). Do not use this unit in an area less than 100 cubic feet, or in small enclosed spaces like closets or cabinets. Place can on raised surface near middle of room. Spread paper or cloth directly below can for protection. To lock valve into open position for total discharge, press valve button all the way down, locking the catch. Leave room immediately. Before reentering area, ventilate for at least 30 minutes. Note: Valve can be operated to give short bursts of spray by lightly depressing valve and pointing can toward area to be sprayed.